Toronto, Ontario--(Newsfile Corp. - August 14, 2018) - Pancontinental Resources Corporation (TSXV: PUC) ("Pancon" or the "Company") announced today it has completed a Virtual Time Domain Electromagnetic (VTEM) survey over part of the Company's early stage nickel-cobalt-copper Montcalm Property. The Montcalm Property is one of three properties included in the Company's Montcalm West Project, near Timmins, Ontario. The Montcalm Property is adjacent to Glencore's former Montcalm Mine, which previously mined 3.9 million tonnes of Ni-Co-Cu ore and produced more than 4 million pounds of cobalt (Ontario Geological Survey, Atkinson, 2011). "We are encouraged by the initial analysis of our first VTEM survey work at the highly prospective Montcalm Property. We look forward to completing in-depth analyses once the data has been further processed and studied by our experts," said Layton Croft, Pancon's President and Chief Executive Officer. "We will soon fly a state-of-the-art airborne gravity geophysical survey over the same area covered by this VTEM work. The gravity geophysics, combined with the VTEM results as well as surface electromagnetic geophysical surveys we plan to conduct this fall, will enhance our understanding of potential mineralization and assist in the development of the winter drill program on our Montcalm Property." In addition to the 13 anomalies, the map below also includes 14 additional targets (U1-U14) identified by previous operators using the University of Toronto's Electromagnetic (UTEM) technology. Pancon will be further testing these 14 targets using surface electromagnetic geophysics in Q4 2018. 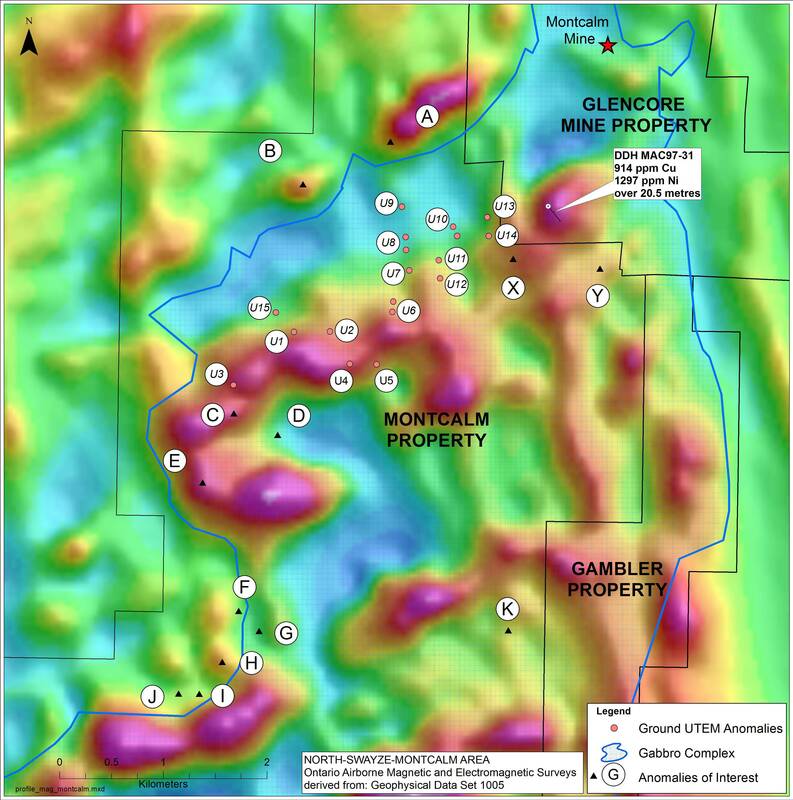 Of particular interest is the two weaker VTEM anomalies (X and Y) located near Montcalm Property's northeastern boundary (in top-right quadrant of map) that appear to be associated with a magnetic high extending from Glencore's former Montcalm Mine property. A historic hole located approximately 300 metres north of the Pancon-Glencore boundary was drilled by Teck Exploration Limited (1997) to test a portion of this magnetic high, which had no identified electromagnetic anomaly. The hole returned 1297 ppm nickel and 914 ppm copper over 20.5 metres. Some weakly anomalous cobalt values were also noted in the intercept. The mineralized intercept in the Teck drill log is described as "interstitial pyrite, pyrrhotite plus or minus chalcopyrite to semi-massive net textured pyrrhotite plus or minus chalcopyrite." These results are historical in nature and pre-date NI 43-101 standards. The data is believed to be reliable, but it has not been verified by the Company. The Montcalm Property (3,780 hectares) is contiguous to and surrounds the western, northwestern and southwestern portion of the former Montcalm Mine, which previously mined 3,931,610 tonnes of ore grading 1.25% nickel (Ni), 0.67% copper (Cu), and 0.051% cobalt (Co), producing in excess of 4 million pounds of Co (Ontario Geological Survey, Atkinson, 2011). 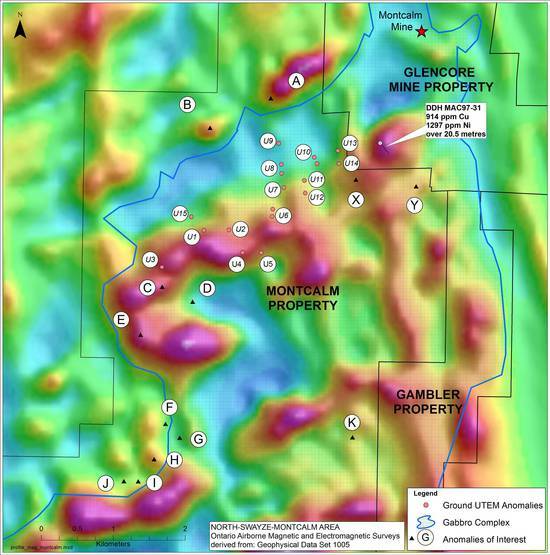 The gabbro phase lithology has been the priority target at the Montcalm Property due to the fact it hosted the former Montcalm Mine, which was discovered and developed based on a single airborne electromagnetic anomaly identified in the 1970s. The Montcalm West Project covers nearly all available land within the prospective Montcalm Gabbro Complex and borders the former Montcalm Nickel-Cobalt-Copper Mine. In January 2018, Pancon acquired an option to earn a 100% interest in the first two properties of the Montcalm West Project: the Montcalm Property and the Nova Property (as detailed in its January 10, 2018 news release). On April 10, 2018, Pancon acquired 100% ownership of the Gambler Property through a new online staking system, covering an additional 6,980 hectares and bringing the Company's Montcalm West Project aggregate land position to 11,600 hectares (as detailed in its April 17, 2018 news release). The Nova Property (840 hectares) is located approximately 19 kilometres southwest of the Montcalm Mine. The technical information in this news release has been prepared in accordance with Canadian regulatory requirements as set out in NI 43-101 and reviewed and approved by J. Kevin Filo, PGeo, a Qualified Person as defined by NI 43-101, a member of Pancon's Technical Advisory Committee, and Pancon's Project Manager for the Montcalm West Project. Certain technical information within this news release is historical in nature and pre-dates NI 43-101 standards, this information is believed to be reliable however the Company has not verified this material. Pancontinental Resources Corporation (TSXV: PUC) is a Canadian-based mining company focused on exploring and developing its advanced stage McBride Nickel-Cobalt-Copper Project and its early stage Montcalm West Nickel-Cobalt-Copper Project, both in Ontario, Canada. Pancon's strategy is to acquire and create value from prospective assets in low-risk areas with existing resources and/or in proximity to producing or former mines. The Company also holds 100% interest in the Jefferson Gold Project in South Carolina, USA. In 2015, Pancon sold its interest in its Australian rare earth element (REE) and uranium properties, formerly held through a joint venture, and retains a 1% gross overriding royalty on 100% of future REE production.